The fresh, oriental floral fragrance of CH was composed by Olivier Cresp of Firmenich in cooperation with Rosendo Mateu, the Puig house nose, and Carolina Adriana Herrera, the founder’s daughter. It comes in a squat, cylindrical bottle wrapped in red leather featuring the CH logo. A silver CH logo on a red ribbon decorates the bottle’s neck. Other recent launches from Carolina Herrera: 212 Splash and 212 Men Splash. 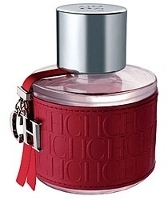 Update: Carolina Herrera CH is available in 50 and 100 ml. To me it seems C.Herrera just repackages the same scent into different sleek looking bottles, IMO. I have yet to find one C.H. scent that needs to be a part of my scent wardrobe. I used to like Herrera for Men eons ago and it's a nice scent. But now, I can't wear it. I sort of outgrown it's datedness. Oh well. Have to admit I have tried very few of them, so can't comment. I love this new fragrance and the bottle is so great! Really want to try this one – what US stores are carrying it? Is it out yet? Thanks for the help! Hi RR, I haven't seen it in the US as of yet. That doesn't mean it isn't here — but it isn't at any of the major online stores. I tried this at nordstrom today and i liked it. To me it smells just like Britneys Believe which i liked as well. Its nothing amazing but its pleasent enough that i wouldnt mind smelling it everywhere. Its cozy and comforting. Im loving the cinnamon and woods in the base. the more its on skin the more i like it. i like it 100 times more then Couture Couture! Thats for sure! Cant wait for CH for men! I was at Nordstrom 2day and I forgot to look for the Red&Gold CH. I saw it on there website and was curious about it. I think its a different scent from the original CH. So mad I forgot. I also wanted to try the Narciso Musc. I dont think they have the mens yet. Still waiting on CH for men too. They have it at NM too. I was not impressed, but I only tried it very quickly and NM had so many great new scents in that it didn’t get much attention. Bottle is nice though!